The Golden Triangle sounds like an award given to the world’s best orchestral triangle player. This is very far from the truth. 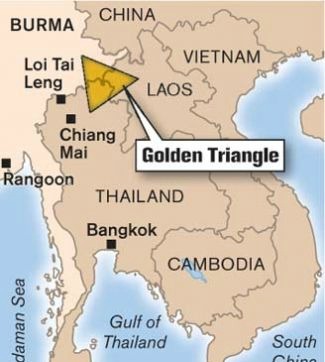 The fact of the matter is the Golden Triangle refers to the second largest opium (heroin) producing region in the world. This term gets its name for the area where 3 countries come together. The three countries include Myanmar, Laos, and Thailand. 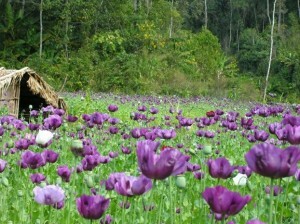 The opium produced in this region accounts for 18% of the world’s production. Poppy is a rather pretty flower, don’t you think? The farming of poppy is directly linked to poverty. According to Jason Eligh, the country manager for the UNODC (United Nations Office on Drugs and Crime) when talking about poppy villages stated, “In poppy growing villages, significantly more households are in debt and food insecure than in non-poppy growing villages.” Simply put, poppy production creates more revenue than the typical crops like rice and corn a farmer could grow. Farmers then grow poppy to feed their families and their villages. Not only is poverty a main concern in these areas but so is drug abuse. The locally known drug produced by poppy seeds is called, “yaba” and the rate of use is “much higher” in villages that grow poppy than in other areas of the country. Mission Arabica’s Laos coffee comes directly from a company in Northern Laos called Saffron Coffee who is working with former poppy farmers. 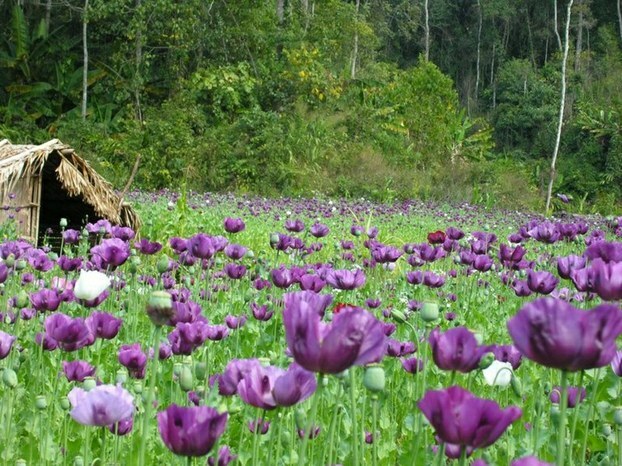 The Lao government has taken a stand against poppy growing, and rightfully so. However, how they institute this law leaves farmers and their families in desperate need. The Lao government in a lot of cases simply comes in and burns the farmer’s fields. They do not help re-plant another crop, nor finance them for their loss. They simply leave them to fend for themselves. In an effort to provide for their families farmers resorted to “slash and burn” methods. Slash and burn means they cut down an entire mountainside, plant corn or upland rice, and then abandon the field the next year to do the same thing somewhere else. Often times a farmer will not return to the same field for 15 years to plant again. Without the income the farmers were generating from poppies, they faced extreme financial challenges. To address this problem, Saffron has started coffee tree nurseries in northern Laos. After the trees have reached a specific size they are then given to these same farmers to plant in their fields. It doesn’t stop there though. They then work with the farmers to show them the correct techniques for cultivating the coffee trees to produce a high quality coffee. They work with the farmer literally from the SEED to the cup. These farmers make an average of 3-4 times more than they would growing corn or upland rice.